'For the online retailer, see Amazon.com. 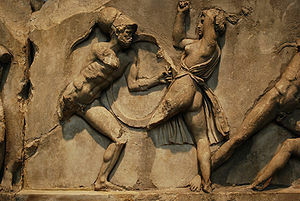 Bas-relief of a fragment from the Mausoleum of Halicarnassus featuring warfare between Greeks and Amazons. Amazon (Ancient Greek: Ἀμαζών) refers to race or band of warriors comprised exclusively of women, and said to have lived near the shore of the Euxine, or Black Sea where they had formed an independent kingdom centered near the mouth of the Thermodon River in what is today modern Turkey. In large part mythological, recent historical and archaeological evidence indicates these warrior women may have existed as part of the ancient Scythian peoples. The word “amazon” has its origins with the Ionian Greek language of Asia Minor, in what is today modern Turkey. Greeks who settled there came into contact with Persians, of which the word ha-mazan, ("fighting together") originates. These ancient Iranians also gave rise to a people known as Scythians, who lived near the shores of the Black Sea and the steppes to the north; they were renowned for their cavalry. Changes in dialect would turn ha-mazan into Amazōn. A folk entymology has the word originating with a-mazos (“without breast”); according to mythology Amazon warriors were better able to handle the bow and arrow after cutting or burning off the right breast, despite artwork from the time depicting both breasts. It is to the Greeks that we have the earliest and most familiar accounts of the Amazons. Many of the stories, including those based in mythology, the Amazons dwelt in the area of the Thermodon River (near modern Terme, Turkey) after arriving from Palus Maeotis (Sea of Azov); it was at the Thermodon that they founded their capitol Themiscyra. To keep their race from dying out they had sexual relations with a neighboring tribe called the Gargareans. Female children which resulted from their liaisons were brought up by their mothers, to train in hunting, warfare, and agriculture; male children were put to death, with some of the more fortunate ones returned to their fathers. When the Greeks were at war with the Amazons (whom the Scythians call Oiorpata, a name signifying in our tongue killers of men, for in Scythian a man is “oior” and to kill is “pata”), the story runs that after their victory on the Thermodon they sailed away carrying in three ships as many Amazons as they had been able to take alive; and out at sea the Amazons attacked the crews and killed them. According to the Greeks the Amazons made numerous excursions to Scythia, Thrace, the coastline of Asia Minor and into the islands of the Aegean, even going as far south as Syria, the Arabian Peninsula, and Egypt. The cities of Ephesus, Paphos, Sinope, and Smyrna were said to have been founded by them. When the Greeks settled into Asia Minor they were aware of what was called “the Amazon district” on the south shore of the Black Sea, but they had to explain their absence when none of the warriors were found. This gave rise to several well-known tales of mythology, chief among them involving the heroes Herakles and Theseus, and the Trojan War. In his ninth labor, Herakles was sent by Eurystheus to collect the belt of Hippolyte, the Amazon queen and the greatest of their warriors; the belt itself was a gift to her from the god of war, Ares. When Herakles landed at their city, Hippolyte came out to ask what he wanted, and upon learning the request was friendly had every intention of offering the belt as a gift; Hera – queen of the gods and an avowed enemy of Herakles – whispered into the warriors that Hippolyte was about to be taken, so they put on their armor, gathered their weapons, and prepared for battle. Seeing this, Herakles killed Hippolyte, took the belt, and he and his men fought their way back to the ship, later giving the belt to Eurystheus. Theseus also figured into some of the Herakles tales, either accompanying him or going off on his own to kidnap Hippolyte and make her his bride and queen. A similar tale is told with Theseus’ involvement with Antiope, who fell in love with the Athenian king and went back with him willingly, marrying him and giving birth to a son. The Attic War happened later, with the vengeful Amazons hoping to rescue Antiope and retrieving Hippolyte’s belt; this ended with Antipoe’s death at the hands of another Amazon and their defeat at Ares’ Hill. In Homer's epic tale of the Illiad the Amazons had invaded Lycia, but were defeated by the Greek hero Bellerophon; this man in turn was expected to die at their hands by the king who sent him out, Iobates of Lycia. A young man named Priam had given his assistance to Phrygians in the face of an Amazon attack; years later this same Priam would be king of Troy, and the Amazons under Queen Penthesileia would be his ally against the Greeks under Agamemnon during the Trojan War. Penthesileia would be slain in battle by Achilles, who wept when he discovered a beautiful woman underneath her battle helmet. "Among the hostages and prisoners many women were found, who had suffered wounds no less than the men. These were supposed to be Amazons, but whether the Amazons are a neighboring nation, who were called to their aid at that time, or whether certain warlike women are called Amazons by the barbarians there, is not known." "...the Hellenes, having conquered them in the battle at the Thermodon, were sailing away and conveying with them in three ships as many Amazons as they were able to take prisoners. These in the open sea set upon the men and cast them out of the ships; but they knew nothing about ships, nor how to use rudders or sails or oars, and after they had cast out the men they were driven about by wave and wind and came to that part of the Maiotian lake where Cremnoi stands; now Cremnoi is in the land of the free Scythians. There the Amazons disembarked from their ships and made their way into the country, and having met first with a troop of horses feeding they seized them, and mounted upon these they plundered the property of the Scythians." "...in Europe is a Scythian race, dwelling round Lake Maeotis, which differs from the other races. Their name is Sauromatae. Their women, so long as they are virgins, ride, shoot, throw the javelin while mounted, and fight with their enemies. They do not lay aside their virginity until they have killed three of their enemies, and they do not marry before they have performed the traditional sacred rites. A woman who takes to herself a husband no longer rides, unless she is compelled to do so by a general expedition. They have no right breast; for while they are yet babies their mothers make red-hot a bronze instrument constructed for this very purpose and apply it to the right breast and cauterise it, so that its growth is arrested, and all its strength and bulk are diverted to the right shoulder and right arm." The ancient Greeks usually portrayed Amazons in their artwork as similar to their own women; dress is essentially the same, i.e. the rectangular cloth draped over the body and pinned at the sides. In friezes known as "amazonamachy" the Amazons bear the same weapons as their Grecian foes (bow, spear, axe, and sword), and this style of artwork would decorate many famous temples throughout the Greek world. The one common exception was the shield, a half-crescent devise called a "pelta", familiar to Greek hoplites as a wooden, leather-covered light shield meant for a mobile soldier. In later art, such as on painted vases, the mode of dress has changed, becoming peculiarly Persian. Trousers are worn, covering both legs in decorated fabric, and a peaked cap called a "kidaris" is worn on the head. Since the 1950s a large number of Scythian and Sarmatian kurgan tombs were excavated on the Eurasian steppes, revealing the daily life of the nomadic peoples who once lived there. Weapons found with human remains have led archaeologists to assume that the occupants were male; however, DNA testing done on many of the remains have revealed that at least one third were women. In addition, remains of clothing bear patterns similar to the later depictions of Amazons in Greek art. What has been learned from the archaeological evidence is that Scythian women were considered equals of men, i.e. trained to hunt and fight in battle. Although they left no written records, elements of the Scythian language (Circassian) were written phonetically on Greek vases, enabling their translation today. This page was last modified on 28 January 2018, at 11:46.